Durham County, located in central North Carolina in what is known as the Research Triangle, is one of North Carolina’s larger counties. The county seat is Durham. As of 2010, 267,587 lived in Durham County. The city of Durham is home to Duke University and North Carolina Central University, and also the North Carolina School for Science and Mathematics. Durham is one of the most progressive and highly educated cities in the United States. Formerly, the tobacco industry dominated the economy; today the economy is dominated by knowledge industries. Research Triangle Park is located in the southern part of the county and has helped the Triangle region become a magnet for jobs. Politically, Durham County is the strongest Democratic county in the state, a record it has held for three consecutive presidential elections. President Obama won here in 2012 with almost 76% of the vote, besting his 2008 margin. Durham has a high African American population, but this population alone is not responsible for the massive support of Democrats in the county. Durham also has a high population of white liberals, many of whom work in academia or the tech industry. It is one of only three counties in North Carolina where President Obama carried the white vote. About 57% of whites in Durham County voted for President Obama in 2012. One of the reasons the county is so Democratic is because the city of Durham encompasses almost the entirety of the county. Republican strength is concentrated in a few outlying rural precincts. Durham County is divided between four congressional districts. 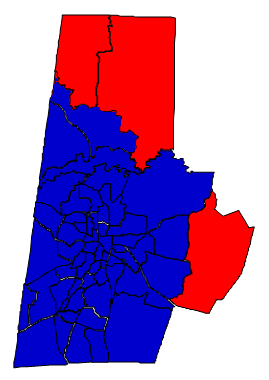 The 1st district takes in the black areas of the county, it is represented by Democrat G.K. Butterfield. The 4th district encompasses most white liberal areas, represented by Democrat David Price. Several more conservative precincts in north Durham County are in the 6th congressional district, represented by Republican Howard Coble. Finally, Carr Township is in the 13th congressional district, represented by Republican George Holding. Needless to say, the equal split in the congressional delegation is in no way representative of the overall politics of the county. Larry Hall, the current North Carolina House Minority Leader, is a Democrat who represents parts of Durham County. Forecast: Durham County is emblematic of the new economy in North Carolina and how it is reshaping politics in the state. Forty years ago, Durham was a working-class community. Academic liberals and the black vote made it solid for Democrats, but occasionally Republicans could compete. In 1972 Durham opted for Richard Nixon over George McGovern. The year 1978 had the most surprising result, when Jesse Helms actually carried the county by a tiny margin. With few exceptions, however, Durham could be expected to go for Democrats. In 1988, Dukakis carried the county by nearly 10 points. But Durham became even more solidly Democratic as the years went on. Now, it is rare for any Republican to exceed 30% of the vote in the county. Durham’s Democratic trend can be pinned almost entirely due to the overwhelmingly Democratic lean of most of its transplants. Even Durham’s white transplants vote liberal. There is a certain degree of self-sorting. Those moving to the Triangle who favor an urban atmosphere tend to find Durham to their liking, and these people are more likely to be liberal. Conservatives with families tend to avoid Durham because of its reputation as a hotbed for crime, though the crime rate has declined in recent years. With a coalition of African Americans, college students, and highly educated whites, Durham was something of a perfect county for Barack Obama. This is not to say that Republicans have bottomed out in Durham County. Far from it. If trends continue, we should start seeing Democrats regularly carry Durham County with more than 80% of the vote in the near future. Because Durham is one of the fastest growing counties in North Carolina, this is bad news for the Republican Party. The growth rate during the 2000s was 19.83%. Current projections show that the county will maintain this rate of growth throughout the 2010s. Even a friendlier, more moderate Republican Party is unlikely to reverse the trend because most of the transplants are groups extremely loyal to the Democratic Party. The bottom line: Durham is an ugly county for Republicans, the ugliest in the state, and growing more hostile by the day.